This pocket guide is for use both by large institutions such as universities as well as by civil society organisations. The word “entity” is used throughout to accommodate both institutions and organisations. 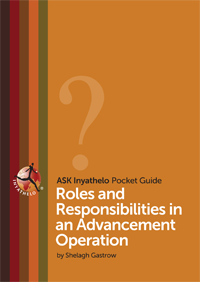 While the conceptual thinking about Advancement, as originally developed by Inyathelo, emerged from the higher education sector, the framework adapts well for non-profit organisations. In the discussions that follow, about roles and responsibilities in Advancement, we focus on the key Advancement principles, and provide appropriate tips and tools for both sectors.